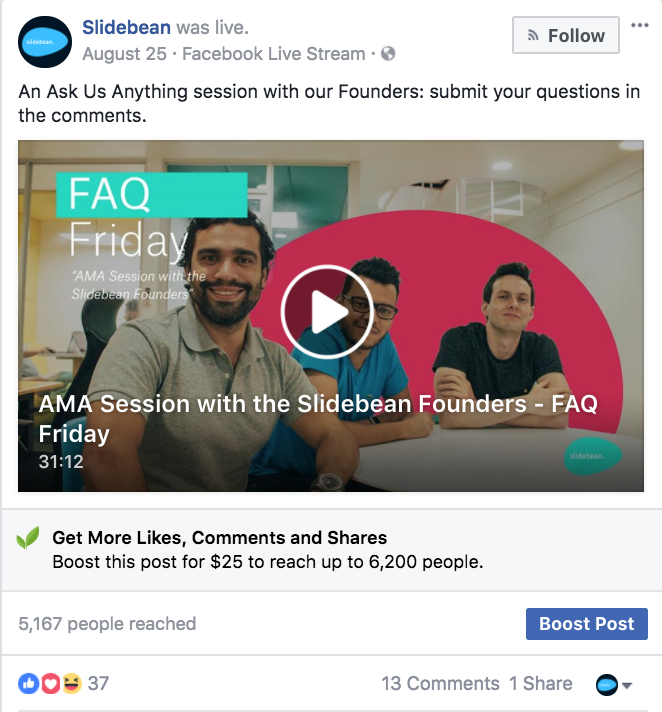 In August 2017 we decided to start a bold experiment: creating one live video every day as part of our Slidebean LIVE initiative. The idea was to leverage Facebook's Live features and the social/organic variable to publish content relevant to our users and potential future users. While not a complete failure, we are pulling the plug and going back to the drawing board with this... and here are the reasons why. One thing is clear for us, video works. Video content outperforms images or links in every possible way, and Slidebean LIVE wasn't the exception. It's no secret that we spend a lot of money on marketing, just take a look at ourMarketing ROI analysis. As a general rule; we decided not to sponsor any of our Slidebean LIVE videos, to be able to measure the organic impact of each one of them accurately. Having a daily 1 pm ET deadline forced us to be on top of each video, it forced us to create valuable content each day, because we just couldn't miss our live deadline. We believe this combination of daily + schedule content was critical to achieving this massive growth in impressions. And it worked, our brand was exposed to 3x more people and 5x more times, causing a boost in website SignUps over the past few weeks. One of the reasons we focused on Live videos was because we wanted to 'hack' Facebook's live notifications, those you get whenever somebody you know is live. The notifications are useful, and indeed, got more people to see our content... but that effect dialed down as time progressed. The first video got over 6,000 views, we believe because it was the first time we did it, but by week 4, we got very few impressions and live viewers. Most of our Slidebean Live videos were under 5 minutes long. The only two videos that were 20+ minutes got a fantastic exposure; we believe in part because people had enough time to check them out. The videos that had live discussions in them, or provided an inside look into our company culture, vastly outperformed the webinar-style videos. We believe this boost in performance was due to the ability to interact with the ongoing conversation. A longer format, live discussion allowed dozens of users to tune in and comment, ask and discuss along with our team. These debates also provided an inside look at who we are, following our focus in transparency. These videos are one of the lessons that we are keeping and bringing back soon. Finally, we loved our Slidebean Live because they took a relatively short time to make. The presenter usually took 30-60 minutes to develop the content, and the broadcaster could often prepare and start a broadcast in under 30 minutes. Perhaps the biggest reason for pulling the plug was the terrible retention rates we saw with most of our live broadcasts. Most live videos had less than 10% of viewers watching through the whole thing, which is pretty bad by Facebook standards (one of the references I have is the widely successful NAS Daily channel, which sees 30% retention rate on his average video). We believe the cause of this is the fact that we are publishing work-related content on an entertainment platform. While people also use Facebook to consume news, the main purpose of your Facebook session is procrastination, rather than going through a class. Live video inevitable has some production constraints. Very few cameras support live web streaming, which means the quality of the video is inferior to other comparable content you see on the platform. While we believe it's 'understandable' that there are limitations when broadcasting live, however, we are competing against very high-quality content, and the reality is most of the viewers won't watch the live video, but the recording. 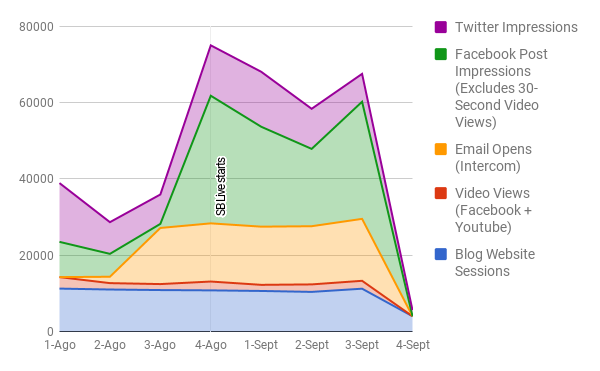 Contrary to Youtube, a Facebook video doesn't really accumulate or increase in relevance over time. Facebook has a massive viral/organic advantage over Youtube: each like, comment or shares actively contributes to the video's rank and exposure.., however, the visibility of a given video rarely transcends the week when it was posted. Regardless of how popular a video was when it was published, it will have close to zero views in the weeks after. This is bad for producers because it means that older videos are rarely discovered, and thus, exposure and organic reach exists as long as you keep posting content very often. Keeping our daily video content, daily. 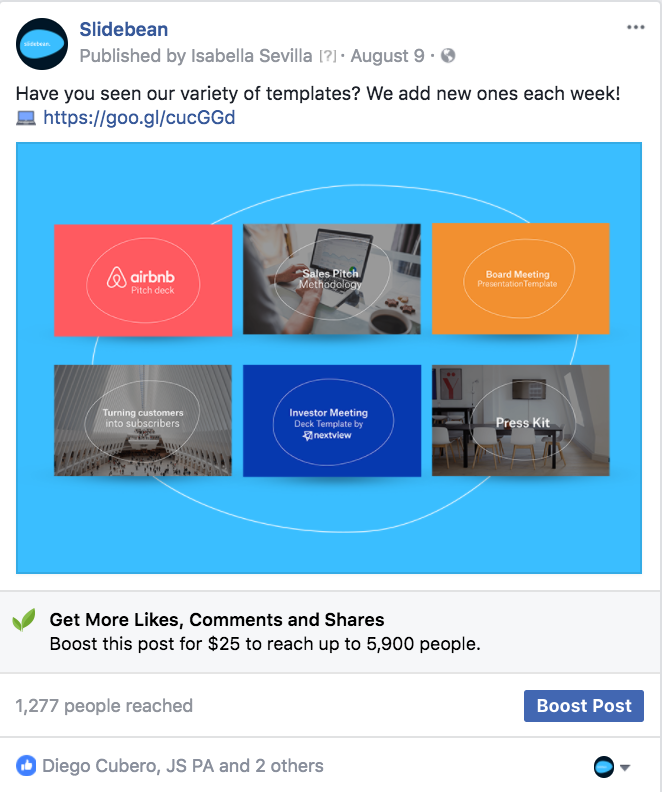 We still believe the best way to increase our brand exposure on Facebook is through video... and to leverage that we need to publish daily, or close to daily content. We are keeping some of our most successful series, such as The Good, the Bad and the Tip and Startups & Spirits, and we are re-thinking the live discussions and Q&A sessions we had as part of Slidebean Live. We'll be rolling out some of that new content over the next couple weeks- with the clear notion that Facebook is an entertainment channel, not a work/learning platform. One of the coolest experiments along those lines is a new series we are codenaming 'The Office', which is a new and funny glimpse into ~live~ life inside Slidebean. Stay tuned. Have you made any Facebook video experiments? Let us know how they went in the comments below!